Laid up with excruciating sciatica pain, my mind started to meander towards Frida Kahlo’s experience, not that I could in any way compare my pain to hers. But the immobility and what she managed to do with it…I’ve shared the couch with Maudie the dog and found the most comfortable position to be flat on my back and with the affected leg raised. Other than checking email, or Youtube for exercises to ease my pain and the restriction in my leg, I didn’t manage to do much. The laundry basket piled up, the floors needed vacuuming and mopping; there was also a piece of felt that needed finishing and rinsing. All went undone, until my mother suggested I get up off the couch and start moving my body. So I dragged myself up and hobbling about started on the chores, retreating back to the couch when the pain screamed down my leg, which was every few minutes or so. But Frida…she painted and drew a whole oeuvre, and quite a great deal of it on her back. She managed through the pain to make herself into a work of art too, managing her ‘toilette’ so that she was always beautiful, with her hair piled up and twisted with flowers; whereas, my hair got quite feral and close to turning into dreadlocks, when all I could manage was to brush it off my face and hold it back with an elastic band. 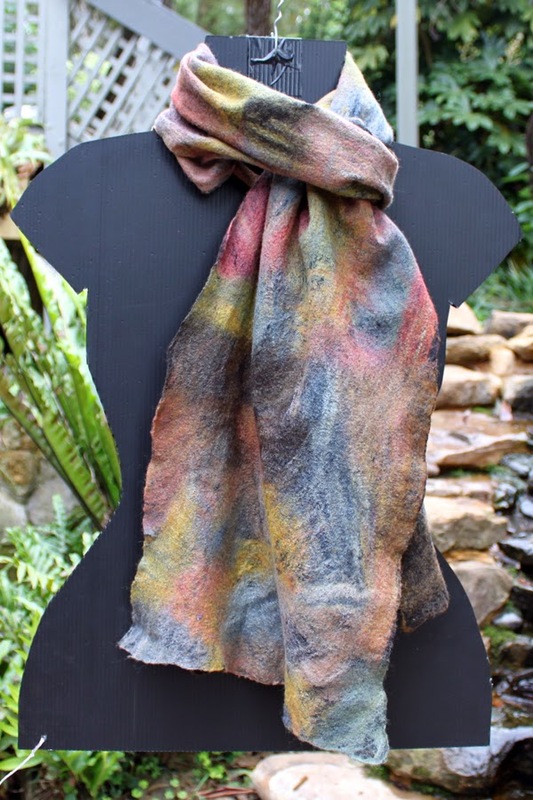 As a woman I find Frida touches me on so many levels – the ordinariness of her work, drawing from her reality and the bold determination and often defiance, of her beautiful face. She never ‘let herself go’ in the modern parlance. And those tears…it’s common knowledge that Frida was influenced by small Mexican votive paintings but there is also a tradition in Western painting of tears as devotion, tears not as painful but as pious. There’s a small medieval devotional painting by Dieric Bouts called Weeping Madonna that is a superb example of the devotional and it was meant to move the viewer, when meditating upon it, to tears. 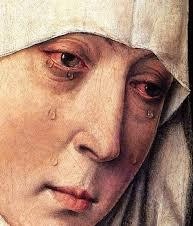 Bouts' painting was produced to encourage the viewer to identify with the Madonna or the Christ (the picture has its companion piece) and to feel over time that their tears were your own. I can't help but relate Frida's focus on tears to this type of painting. It may be that Frida wanted us to be moved by her tears, to cry with her, for her, as well as ourselves. She stares out at us, for instance in Broken Column (1944) unlike a mediaeval saint that usually looks heavenward, strapped in her corset, the Doric column representing her broken vertebrae or centre, small nails or tacks dig into her flesh, as well as the fabric that wraps around her lower torso, the tears falling milky and intense. The tacks could be thorns. She doesn’t look to heaven for her salvation, but towards us, the viewer. As the Madonna in Bouts' painting will never stop crying, so too will Frida's tears be eternal. There's another Self Portrait (1940) in which Frida wears a necklace/crown of thorns, so the evocation and association of Christ to her suffering, as well as the linking of her pictures to religious icons is quite obvious and poignant. Painting undoubtedly saved her and reduced the monotony of all those hours when she was immobile. 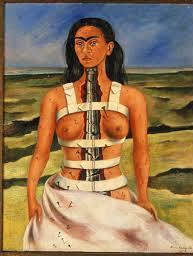 Her painting has also produced a contemporary cult following for anything Frida. I present below my devotional to Frida. 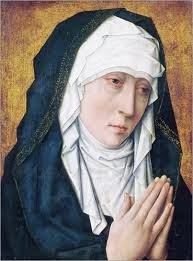 For more about Dieric Bouts' painting see James Elkins, 2004, Picture and Tears (Routledge), chapter 9. I wonder...Do you think that if Frida had not been in such pain throughout her life, that her work would have been known, in her own right...independent of Diego's work? Anyway, such an intriguing person/artist. You're the one who really introduced me to her work, so thank you, Joni.